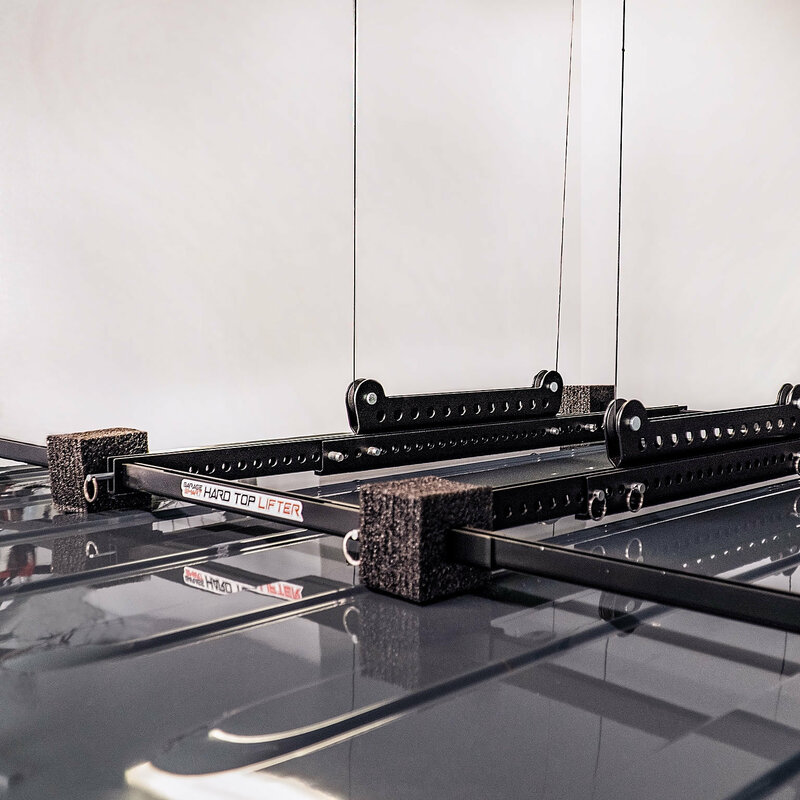 The Hardtop Lifter from Garage Smart makes the task of removing any Jeep hardtop quick and simple. The universal design includes brackets that will fit any Jeep Hardtop from JK 2 door, JK Unlimited 4 door, and the JL vehicles as well. The strong 2.5mm diameter cables are 23 ft. long and will fit well with garage ceilings from 8 ft. to 16 ft. in height. The DIY installation can be done with standard hand tools, with some drilling involved into the garage. 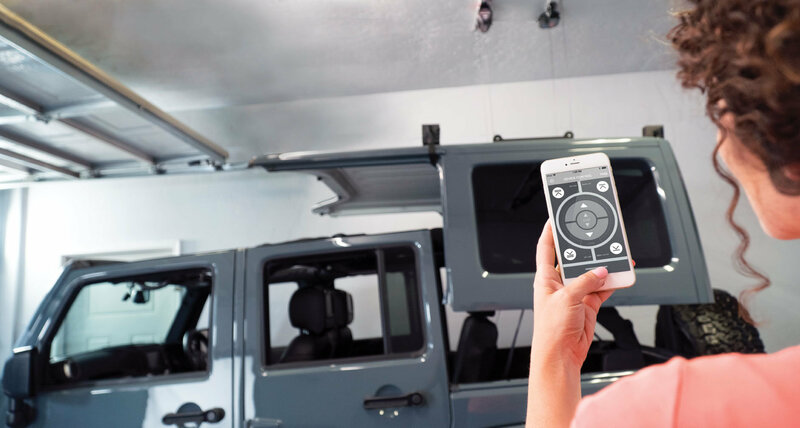 Once installed, simply download the APP (compatible with iOS or Android) and operating the lift is done right from your smartphone or tablet via Bluetooth connection! The two electric winches have internal locks that prevent the potential for slipping and will not let the hardtop fall, keeping you and your valuable hardtop safe from any damage. 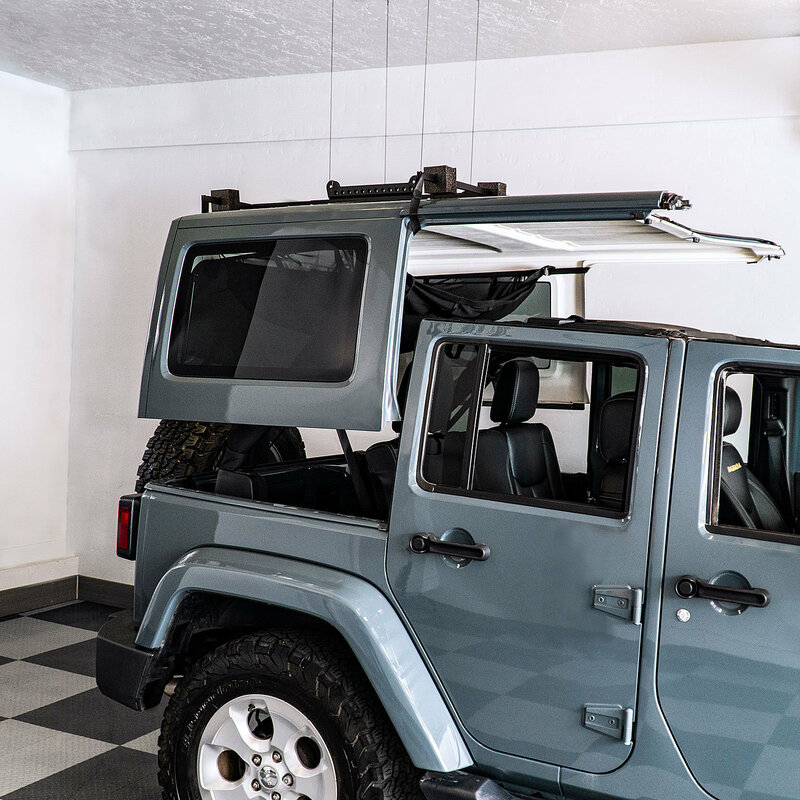 Store your Freedom Panels inside the top when lifted with the included storage pockets that attach easily to the interior of the hardtop. Easily lift off the hardtop within seconds! 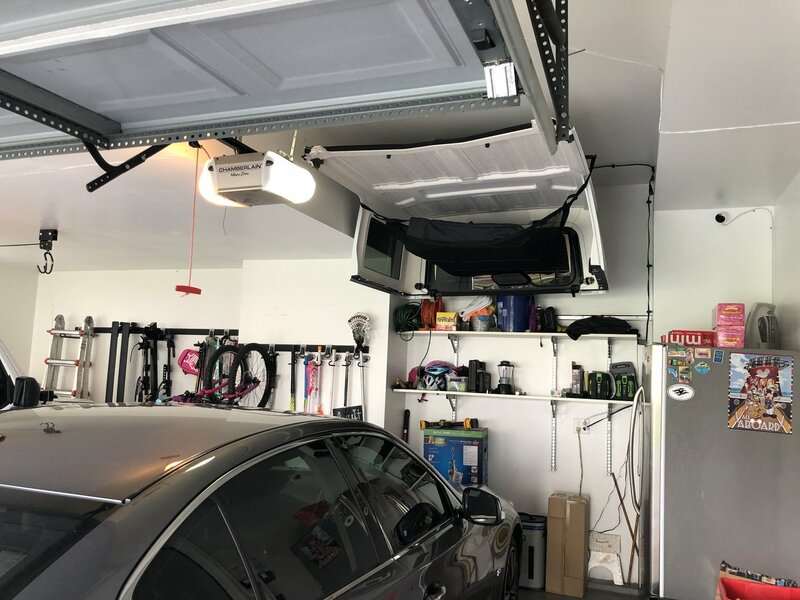 Gone are the days of struggling with a heavy hardtop with two people, not to mention storing the top on a cart or on the floor. Store your hardtop up and out of the way with the Hardtop Lifter. All necessary hardware and detailed instructions are included for easy installation. Universal Application: The Hardtop Lifter is made to work with any model of Jeep Hardtop. The brackets are designed specifically to extend or retract in different positions which ensures for a perfect fit for different models. Easy Operation: Once the lift is installed, operation is as simple as pushing a button. 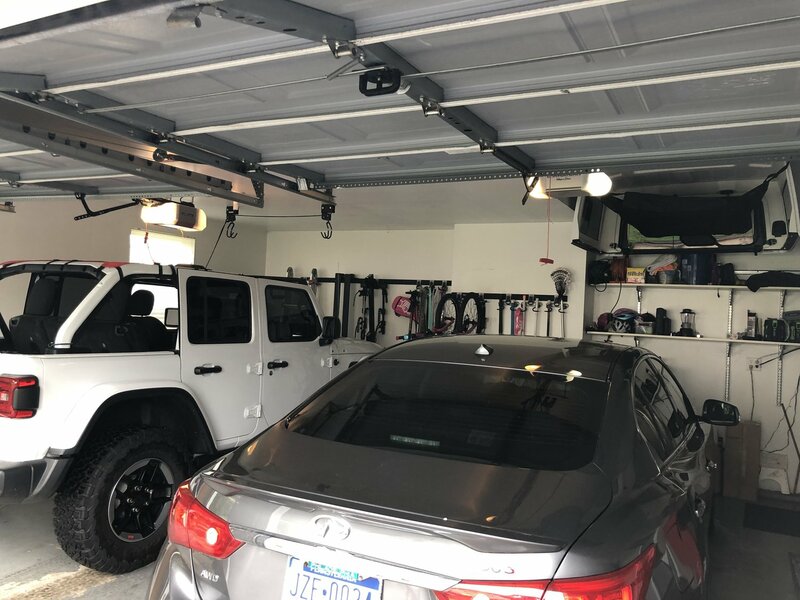 Using a smartphone or tablet with the Garage Smart App, easily control the Hardtop Lift via Bluetooth connection. 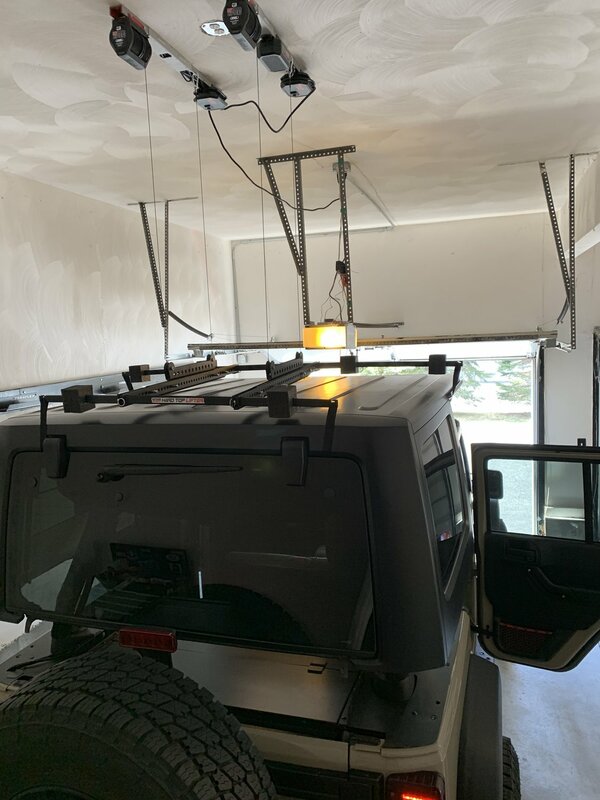 DIY Installation: The Hardtop Lifter includes all of the necessary pieces for the installation of the unit. Detailed instructions are included and videos are available to assist. Simple hand tools are required and not included. Within a short time, you will have a safe and secure storage option for your Jeep Hardtop that is built to last. Ceiling Height: 8 ft.-16 ft. 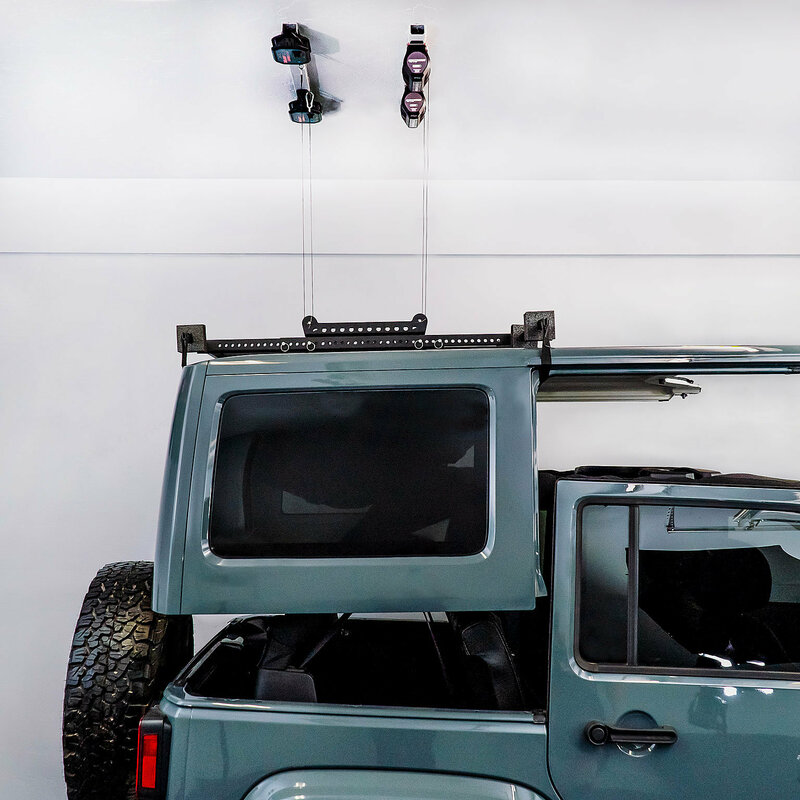 This hardtop hoist is so easy and so awesome. Its fast and its balanced and its easy and that makes dougie happy! 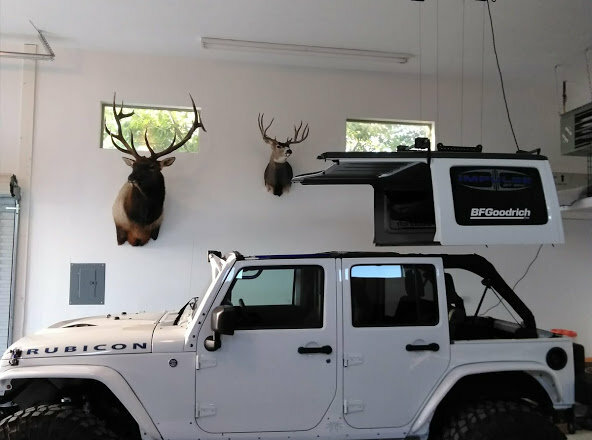 This is by far the very best hardtop lift and storage system on the market. I've tried other brands and I ended up replacing them. This system is remarkably well designed. It comes with two motors which really is the only way to lift balanced without tilting every time. 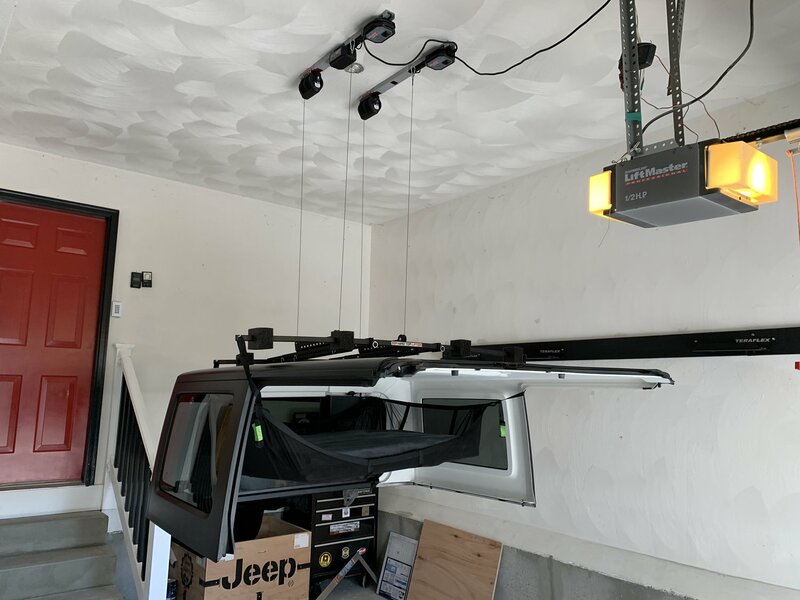 It's also Bluetooth controlled (no internet required) just Bluetooth, which is perfect because I have a tall garage and my corded system before didn't have a long enough cord to get the job done. Plus it was always in the way. This system is sleek and looks really clean when installed. It also comes with a cargo net for the freedom tops. Nothing compares to this system. I'm a very happy customer. Top is off and balanced in less than 5 minutes!